At a time when Allied states men were taking various steps to work for an enduring peace “to save succeeding generations from the scourge of war”, in Kalimpong, this remote corner of India, a quiet sort of revolution was set afoot as if in affirmation of H.G.Wells prediction that history after the war would be a race between education and catastrophe. That was in 1941; the year Fr. Aurelius Gianora, the Superior of Swiss Fathers (Canon Regular of St. Maurice, Switzerland) entrusted Fr. Benjamin Stolke (Diocesan Priest) to take up the task of tutoring a handful of boys from St. Joseph’s Convent, Kalimpong, for admission to St: Joseph’s School, North Point, Darjeeling. Strange but factual, history abounds in such anomalies because it is always in the making. For some years the boys were cocooned in one of the rooms of the old presbytery. Perhaps this splendid ‘gurukul’ system would have flourished had not Japan joined the War on the side of Germany. Southeast Asia became vulnerable to Japan’s designs. Calcutta was then considered an inevitable target for bombardment. Anxious parents from the plains, therefore, shifted their wards to safer pastures in the hills. Luckily, the word ‘deforestation’ had not gained currency in those days and Kalimpong was considered a safe haven. This unexpected turn of events, however, presented some practical problems of resource and space for the school authorities. To cope with the students who were at various stages in the completion of their studies was quite a task. With a slight blush Fr. E. Gressot recalled that the school was ‘bursting at the seams’. Thus early in the day the school was thrust with a high school identity and forced to march to the new presbytery for more breathing space. Towards the end of the War in 1945, Mgr. Gianora entrusted Fr. Ebehard the task of upgrading the tutorial class to a regular school. The first Admission Register had 27 entries in that year. A man of vision, Mgr. Gianora foresaw the future needs and purchased fourteen acres of adjacent land. Presumably not to be enmeshed in copyright litigations, the land purchased by Mgr. Gianora, came to be called, the New Land (John Cobott had already discovered Newfoundland in 1497) The resource crunch, which often plagues the banished children of Eve, however, stood in the way of realization of a proper school building. Around this time, Fr. Albert Lee took up the charge of the school. He was instrumental in having the school affiliated to the Cambridge University. In 1952, the school presented a lone candidate for the Senior Cambridge Examination. After graduation he joined the faculty as an honourable member of the staff. Mr. Tej Man Tuladhar served the institution for twenty seven years. After the Chinese takeover of Tibet in 1959, the administration took up the added responsibilities of accommodating hundreds of boys who were uprooted from their country. Brother Peter Grobety succeeded Fr. Lee as the Principal. Within a short span of time he so enhanced the popularity of the school that it became imperative to find the final solution. No effort was spared, no stone left unturned to affect this end. The situation was aggravated due to the provision for a variety of streams for the ISC Examination. To opt for a single stream would necessarily entail sacrificing the future prospect of the students and to offer different streams would be to court penury. The decision had to be made whether to duck or to deal with the problem. Luckily, the Swiss Technical Cooperation, a Swiss government agency, came to the rescue. Monsieur Philippe Gressot, (Fr. Gressot’s brother) architect and engineer; was called in to study and prepare the blueprint for a proper school building. The construction was completed by 1970. Mgr. H. Salina, the Abbot of St. Maurice, Switzerland, blessed the complex. The finance provided by Miss Pia (Fr. Hofstetter’s sister) made it possible to construct the swimming pool. In the following year, the formal inauguration of the complex took place to coincide with the Silver Jubilee celebrations of the school. The Alumni Association of St. Augustine’s School came into existence in the same year but it soon withered away before it could blossom. The year 1971 also saw the formal recognition accorded to the school by the Board of Secondary Education, Govt. of West Bengal. Under the Swiss fathers, barring a few years when Fr. Martin Ray, Fr. Joseph Hofstetter, Fr. Ruckstul officiated as Principals, Fr. E.Gressot has the longest stint as the Principal. After nearly three decades, his first love lured him to take up pastoral work. If there is one person who deserved an “honoris causa” for having borne bravely the grind and grill of routine life, it is definitely Fr. Gressot. By the year 1973, the new Physics and Chemistry labs were ready to spawn future crops of scientists. In 1975, the first batch of ICSE candidates and the last batch of ISC students sat for their respective examinations. Fr. William Miranda alighted on the scene around this time to help in the hostel. The dining hall being the melting pot for pan-cultural seepage, it became necessary to assuage the gastronomic predilection of the Sasonians. As a consequence, a new kitchen was constructed in 1977. The following year Fr. Thomas D’Souza and Fr. George D’Souza arrived to acquaint themselves with the general feel of the administration. The year 1978 marked an end of an epoch and the beginning of a new one. The Swiss Fathers handed over charge of the Mission to the Roman Catholic Bishop of Darjeeling. Subsequently in the following year, the late Bishop Eric Benjamin appointed Fr. George D’Souza (1978-1979) as the First Principal of the school to launch a new era. Before long Fr. Thomas D’Souza (1979-1984) was given the task to garnish the institution. The school picked up the speed of success and recognition at the hands of Fr. Thomas. He was succeeded by Fr. Felix Baretto (1984-1990) who courageously held the fort, when the political situation in the hills was in pursuit of the public demand for the Gorkhaland. For a brief period Fr. Thomas had to hold the reins before Fr. Paul D’Souza (1990-1996) took up the charge as Fr. Paul was attending the B. Ed Course . Fr. Samuel Lepcha(1997 – 2000) was handed over the responsibility at the end of 1996. During his short stint as the Principal of St: Augustine’s School Fr. Samuel inducted Brass Band in the school. It has the distinction of being the winners for the last seven consecutive years in the Independence Day Parade conducted at Mela Ground, Kalimpong. Around this time the school suffered a short bout of hiatus due to human failure. It needed a man in the person of Fr. Valerian Viegas (2000-2002) caliber to tackle. He addressed the problems with surgical precision. To assist him in this task he received the cooperation and the backing from his fellow priests Fr. Swid Singh as the in-charge of Primary Section and Hostel Superintendent and Fr. Derek D’Souza as the Bursar. Thus within a short period Fr. Valerian was able to rejuvenate SAS and like the phoenix, she soon arose to take her rightful place as a premier educational institution. Fr. Lawrence Monteiro (2002 - 2012 ) succeeded Fr. Valerian Viegas in the year 2002 to continue the legacy of SAS. He has set the wheels of Administration on decentralized mode. The welfare of our students being the common pursuit, creating ambience for the proper nurturing of symbiosis is of paramount importance to all of us. In the course of years we may be able to formulate our own collective experience into a statement of intent to guide us through the tides of time. Once again Fr. Valerian Viegas (2012 - ) has taken the challenge to lead SAS to a greater height. The social climate of the early nineties necessitated the fencing of the school property. Today, as one drives towards the complex, it lends the impression of entering a classified security zone. This, however, is not a sign of insularity. The school has not cut herself off from the matrix of societal aims of education. Even the editorials of the school magazine of the sixties ooze with patriotic sentiments and refer to the contributions made by the Sasonians towards the National Defense Fund in 1962, 1965 and 1971 wars. Different issues of the magazine also allude to the many trips the boys used to make into the lap of nature. The present civilization has bereft us of many an Arcadian haunt of the days gone by. Luckily, the sylvan academic environment was not vitiated in those days with the rhythmic changes of subjects into integration and bifurcation; nor were the authorities befuddled by the fumes of “working days” syndrome. There has been no looking back for SAS. The construction of the grand Primary Section and the tennis court were completed and blessed by the late Bishop Eric Benjamin in 1993. The Golden Jubilee Children’s Pavilion was completed around this time, too. The inauguration of the much needed pavilion across the northern flank of the football field was officiated by Fr. Thomas D’Souza in February 1994. A tennis court (hard court) was constructed in the same year. Now the school has a three-storied canteen to cater to the needs of the staff and students. The inauguration of the Bishop Eric Benjamin Memorial Stadium took place on 20 October 1995 (All work and no play…… et cetera et cetera now stand justified). Towards the second half of 1994, St. Augustine’s Alumni Association was resuscitated. Since history repeats itself, its rebirth was a historical necessity. The Golden Jubilee Year also saw the school bracing herself with the plus two system of education (ISC). In tune with the digital age, the management opted for the science stream. The year 1995 was memorable for more than one reason. Many of us in the Staff got the opportunity to act the ornithologist. 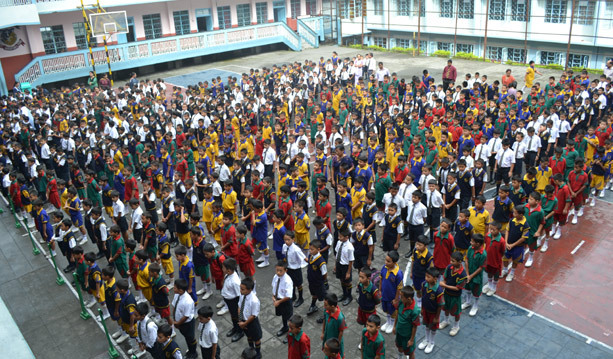 We witnessed the homing instinct of the ex-students who flocked in large numbers to their Alma Mater with plumages of all types for the School Day Celebrations. They frolicked like dolphins in the school swimming pool, treated a sizeable crowd to a sumptuous Reunion Dinner, held a session with the Principal and the staff to bridge the communication gap (as a remedial measure, they even presented the school with a fax machine) and heroically went down fighting the sure-footed, professional school team in a football match. On the evening of 27th August, the air was surcharged with veritable decibels of emotions when each Chapter of Alumni Association tried their vocal chords in order to nurse their aching hearts caused by the ride down memory lane. Call it transformation or metamorphosis, there is no denying the fact that the school has gone through several avatars to achieve its present stature. Many men and women have toiled to give shape and significance to that vision which propelled pioneers. Today, an institution like St. Augustine’s School is a credit to any place. At present there are over 1300 students in its rolls. It is cosmopolitan in character as well as in content. It has definitely lost is nonage! The opening of the Hostel Department to cater to the needs of the students hailing from far flung regions was a felt necessity. In the course of time it had to be revamped with an independent charge by creating the post of the Bursar and Minister to handle it. Earlier however the Swiss Fathers had felt that the principal alone could take care of the financial management along with his normal task as the principal. The new arrangement was not only in keeping with the stated policy of the church to keep wide open the portals of her educational institutions to welcome everyone irrespective of their cast, creed and nationality as a part of an apostolate, but also a sound managerial practice. To this task Fr. Martin Ray, Fr. Hubert Rucksthul, Fr. Joseph Hofstetter, Fr. William Miranda (1976–82) Fr. Noel Pereira (1982–84) Fr. Edward Sangness (1984–1987)Fr. Paul D’Souza(1987–89), Fr. Lawrence Monteiro(1989–93), Fr Abraham K.& Fr. Frederick Lepcha (1993–94)Fr. George D’Souza (1994 – 2000) Fr. Swid Singh (2000–04) Fr. Derek D”Souza (2004– )have greatly enhanced the tone and texture of this institution. Whoever said that, “behind every successful man there is a woman” was a mighty wise guy. Down the years, the Cluny Sisters have provided unflinching support to the School by taking care of the Junior Section and the Infirmary. When the diocese took over the school Fr. Thomas D’Souza, Fr. George D’Souza, Fr. Felix Baretto, Fr. Noel Pereira, Fr. Peter Lingdamo, Fr. George VV, Fr. Edward Sangness, Fr. Jerome Singh and Fr. Abraham K have taken care of what was entrusted to their care. Fr. Derek D’Souza has been fulfilling the task of Bursar at present. Looking into the past is like visiting some foreign land. One is either tempted to pontificate or burst out into eulogies. What is pertinent, however, is to examine how the school approximates in some measure those ideals that sustained it in its growth. It would not be a travesty of truth to state that not only has the structural alignment been maintained but all along the years the succeeding Principals have nurtured continuity in the school’s vision, ideals and goals into the present times. A write up on the past inevitably suffixes a reference to the future. The task of retooling the future demands more than mere multiplicity of activities. It is time to take stock of our assets. It is said that the Romans received everything from the Greeks except their inquiring spirit. Our School’s motto, “Per Ardua Ad Astra” should help us storm the tides. “Through hard work to the stars”, denotes an attitude of the mind rather than a specific article of faith. It is a quest and not a creed. The going should be the goal for the Sasonians not a mere path.